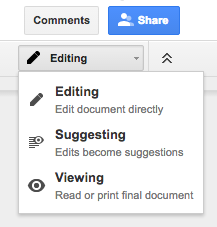 This template may be used as you’re conducing peer review on your project in Google Docs. Find an editable version here. This template was adapted from a similar work created by Billy Meinke at the University of Hawaii, and includes a rubric developed by BCcampus. Our thanks to Billy and the team at BCcampus. Welcome to the guide for Rebus open textbook reviewers. This guide is meant to help you give great, useful feedback on the open textbooks we are helping to develop. You are welcome to print this Google doc, make a copy for yourself, or share with others. Please read through sections below, and use this as a reference as you complete your review. If you have any questions, email the project lead. As we strive to work openly, all contributions made to this textbook will be licensed under a CC BY 4.0 International License. Your name will be mentioned in the published version of the book as reviewer. No OER textbook can serve all learners, so it is important to be aware of the context the book is meant to live in. Take a moment to read through the project summary to familiarise yourself with the book’s purpose and audience before beginning your review. Include a quick summary and description of your project and book here. You should also link to project info page, so interested readers can learn more. Insert a few sentences about the book’s intended audience here. For example: “This book is meant for use in first-year introductory courses. The audience will primarily consist of undergraduates pursuing the major, however can also include some mixed-major undergraduates.” You can include as much detail as you think is necessary, such as technical requirements, reading levels, etc. Comprehensiveness: The text covers all areas and ideas of the subject appropriately and provides an effective index and/or glossary. Content Accuracy: Content is accurate, error-free and unbiased. Relevance Longevity: Content is up-to-date, but not in a way that will quickly make the text obsolete within a short period of time. The text is written and/or arranged in such a way that necessary updates will be relatively easy and straightforward to implement. Clarity: The text is written in lucid, accessible prose, and provides adequate context for any jargon/technical terminology used. Consistency: The text is internally consistent in terms of terminology and framework. Organization Structure Flow: The topics in the text are presented in a logical, clear fashion. Grammatical Errors: The text contains no grammatical errors. Cultural Relevance: The text is not culturally insensitive or offensive in any way. It should make use of examples that are inclusive of a variety of races, ethnicities, and backgrounds. This rubric was developed by BCcampus. This work is licensed under a Creative Commons Attribution 3.0 Unported license. This is where you can add guiding questions for reviewers that are specific to your project. This helps to draw their attention to any areas you think need particular consideration, and helps ensure the feedback you receive is valuable. Please leave feedback in the Google doc using either the Comments tool or by providing feedback with the Suggestions tool. 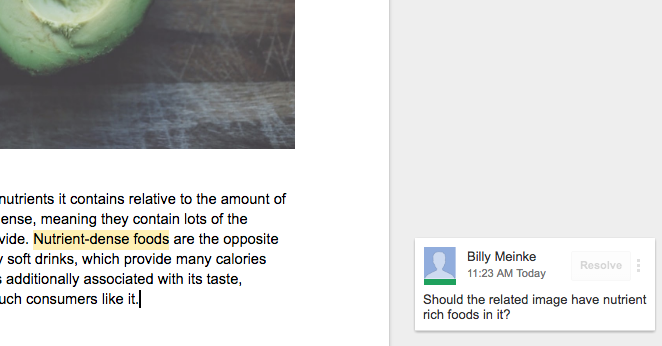 Leave a comment in the document by selecting a portion of text, and clicking on the comment icon. Alternatively, you can select the text, and choose Insert > Comment on the menu at the top of the page, or use the keyboard shortcut for your computer. You can select individual words or whole sentences, leaving feedback on specific parts of the document. Once you enter your comment, be sure to click on “Comment” to save it. Once it is saved, it will appear next to the selected text. You can edit or delete a comment by clicking on the ellipsis in the top right corner of the comment. You can also leave proposed edits in the document by switching to Suggesting mode in the upper right-hand part of the document. Similar to track changes features of other word processing programs, the authors will see your proposed change and selectively roll or edit them in. When in doubt, begin by leaving comments. Use the Suggesting mode as it is useful to you. Here you can add a few sentences about reviewer etiquette. The following is a short example, but could be expanded on, particularly if authors will see reviewer comments – you may want to mention this specifically. When leaving feedback, please be conscious your language and tone and remember that the content you are critiquing is the product of many hours of concerted labour. Keep your criticism constructive, and avoid using derogatory phrases, or making personal remarks about the author. As a courtesy to the author or editor, avoid using abbreviations or short forms of words when providing feedback. Doing so ensures that your feedback remains clear and easy to understand for everyone. If you run into any issues during this process, please contact the project lead. Specify the deadline for completion of review here. If financial compensation is available for reviewers upon completion of the review, you can mention so here. If you plan to credit reviewers in a review statement, or elsewhere in the book, make a note of it here. Find an editable version of this template here. The Rebus Guide to Publishing Open Textbooks (So Far) by Apurva Ashok and Zoe Wake Hyde is licensed under a Creative Commons Attribution 4.0 International License, except where otherwise noted.